Auspreg UV is a range of UV curable resin impregnated fibre glass prepregs which have been especially designed to cure from a wet plyable form to a completely hard product within minutes through exposure to either outdoors sunlight or high intensity artificial light. The technology is useful for repairing a whole range of surfaces and parts as a long term structural solution to wood, bitumen, concrete, metals and enables repair of damaged materials without the need for costly replacement. It is also highly effective in creating and manufacturing products in place of traditional hand lay up manufacturing, infusion systems, and oven cure methodologies. The Auspreg UV materials cure with light and do not require heat or any other chemicals to cure them. The product is supplied as either Vinyl Ester or Polyester resin already impregnated on the fibre glass which simply cures and hardens once exposed to light. Once hardened and "cured", Auspreg UV material forms an impenetrable completely hardened structure with no additional post curing required. 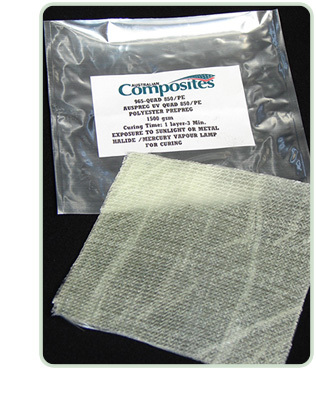 The resins on the fibre glass act as both as an adhesive as well as the curing compound. So multiple layers can be stacked up and cured at the same time and in a single step or process. There is no need to do any anything else other than apply light and a vacuum bagging process (see techniques). Auspreg UV material is so unique because of the way it is manufactured. Australian Composites uses custom designed impregnation equipment with highly sensitive computerised atomic “Beta Ray” gauges that determine the exact amount of resin impregnated onto the glass. Therefore every metre and kilo of Auspreg UV contains the same amount of resin as the next down to .01mm variance. The uniformity of resin impregnation offers the user the confidence that applying the product and curing the product will be the same each time. The amount of resin added has been carefully controlled so that exactly the right amount is deposited for the requirement of each product and customer. Auspreg UV is supplied in 20-40 kilo rolls, 1270mm wide and can be cut down to any width required such as 600mm and even 300mm widths. The product is partially cured and requires “B stage” curing through exposure to light. Prior to curing, the product is flexible, easy to cut, and easy to shape. For curing outside, normal daylight is generally suitable as the light source. For Indoor lighting, generally additional metal halide or mercury vapour lights are required. Auspreg UV can be stored horizontal on a flat surface for at least 12 months in temperatures up to 60 C as long as it is sealed in its original specialised multi layer packaging. There is no need for refrigeration or special storage conditions. The product can also be shipped without the need for refrigeration. Auspreg UV materials are supplied with a thin sheet of polythin on each side. This prevents the material from drying out or curing until it is moulded into the exact position required.